Image 19.1 x 28.2 cm. Folio 21.5 x 31.4 cm. The current painting is from an album of illustrations known as the 'Shangri' Ramayana after Shangri, the place of residence of a branch of the royal family of Kulu who were formerly in possession of the largest portion of these paintings. 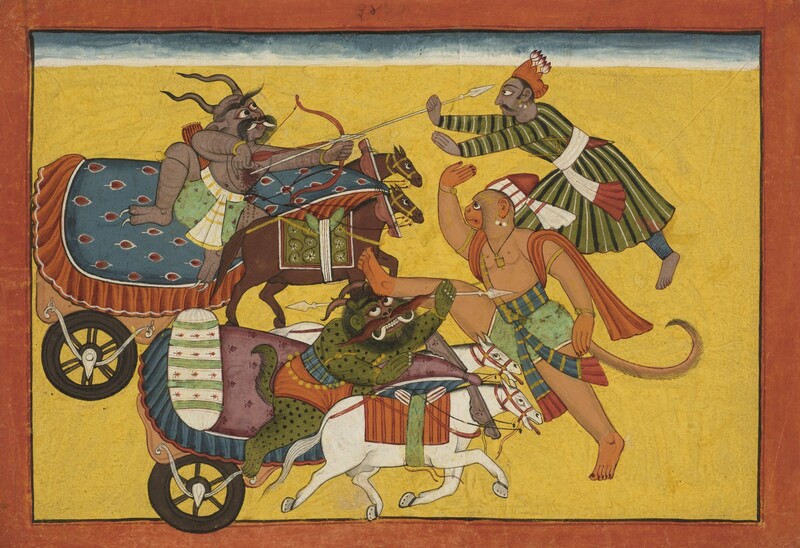 The Shangri Ramayana is widely considered to be one of the most important narrative series of paintings from the Punjab Hills. The series was first rediscovered in 1956 by M S Randhawa in the collection of Raja Raghbhir Singh of Shangri but more recently B N Goswamy reattributed the series to Bahu or Jammu since there are three inscribed portraits of Bahu nobles in this style. However these depictions may have been done as records of visiting dignitaries since there are also portraits of Mankot rulers in a similar idiom. Thus the final attribution remains a matter for academic debate. W G Archer distinguishes four styles within the series and the current work appears to be from style III which has more recently been attributed by scholars such as Darielle Mason to the court of Mandi. Other leaves from this series are in the National Museum, New Delhi; Bharat Kala Bhavan, Benares; British Museum, London; Victoria and Albert Museum, London and several important private collections. Also see Randhawa, 1959, pls. 1-5 pp. 238-243. For other illustrations from the same series, see Sotheby's New York, April 1, 2005, lots 108 & 109; September 20, 2005, lots 125 & 126; March 29, 2006, lots 157 & 158 and September 19, 2006, lots 9 & 10.